This is Tylluan’s seventh book, and her fourth with The Wolfenhowle Press. It deals with something many of us seem to sense – the ancient past – but which is extremely difficult to explore since there is so little information on it. Here, Tylluan has attempted to pull together many different strands, including history, archaeology and even some thoughts from Jung! The result is a roller coaster ride through the ancient past and our own psyche, backed up by extensive referencing, a full bibliography and index. 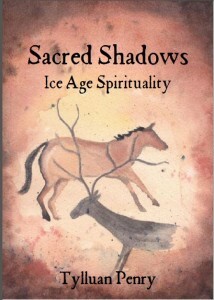 If you have ever felt drawn towards the world of our ancient ancestors, then this is the book for you! The ancient past is always with us, just lurking beneath the surface. It influences what we are, what we do, what we will become. It even invades our dreams. Yet we know next to nothing about it. This book shows how the memories that seem to haunt us are not lost but are waiting to be recovered, so they can form part of our spiritual life, no matter what path we decide to follow. Rediscovering out past, our ancient history, will ultimately help us understand the present and welcome the future…. …because the past never really goes away. It is a truly amazing book Tylluan, I have read this and found it agreeing with things that I had thought of and expanding on others. It made me think so much and was a mine of information, an amazing book to have and to be able to re-read… as each time you realise something more! I love your books for the way they are written and the amount of research that you do… I am finding myself looking at the reference list and thinking I need some of those too Thank you Tylluan for sharing your amazing gift and talent with us all. What an interesting book it gives a great view of all possibilities when looking at our ancient past. It allows the reader to actually think about the possibilities presented and allow their own inner thoughts to ponder on recent family history and ancient past similarities. I really like Tylluan’s present day analogies to ancient past theories. The linking of past and future cycles was a great way to end the book.